Good Guys Media and golf's governing body The R&A announce the release of Five Days in July - The Story of the Open Championship 2015. Historic, dramatic and unpredictable, the 144th Open will long be remembered. Featuring exclusive interviews with Zach Johnson, Jordan Spieth, Jason Day and all the leading figures of a compelling championship, 'Five Days in July' skillfully weaves together the many storylines that created such an unforgettable occasion. The canvas for this sporting masterpiece was the Old Course at St Andrews, the recognised home of golf. Outstanding performances, extreme weather, and the emotional farewell of Tom Watson, the greatest links player of the game s modern era, supplied ample colour. So did a notable absentee; when injury prevented world no.1 Rory McIlroy from defending, the spotlight shone brightly on a 21-year old Texan. Jordan Spieth arrived in Scotland having won both the Masters and US Open and his desire to remain on course for the elusive Grand Slam would illuminate the Championship. Jason Day was motivated to claim his major breakthrough; fellow Australian Marc Leishman so nearly upstaged everyone and Louis Oosthuizen came close to succeeding at St Andrews again, having dominated there in 2010. Paul Dunne, an amateur from Ireland, led after 54 holes, inspiring headlines around the world. The elements dictated a rare Monday finish and even then, 72 holes were not sufficient to decide who would lift the Claret Jug. In a dramatic play-off, it was a battler from America's mid-west that stood firm. After Five Days in July, Zach Johnson had outlasted and outplayed the field to become the Champion Golfer of the Year. Good Guys Media and the AELTC announce the release of the Wimbledon Gentlemen's Final 2015. "It's a dream come true again. Even though I've won it for a third time, every time it feels like (the) first", the words of Novak Djokovic after he wore down Roger Federer to become the Gentlemen's Singles Champion at The Championships 2015. The two top seeds, Novak Djokovic and Roger Federer were the last men standing in the quest for the 2015 title. The Swiss was in search of a record eighth title, while Djokovic sought to retain his Wimbledon crown. The intensity of play was mesmerising as the pair matched each other shot for shot and point for point. Coaches and former foes Stefan Edberg and Boris Becker took it in turns to rise from their seats to chivvy first Federer and then Djokovic on, but it was the Serb's serve which was holding up well continually putting him ahead and Federer on the back foot. While Federer had won the first set and Djokovic the second in their epic in 2014, their roles reversed a year later, Djokovic taking the early advantage and Federer fighting back. But the effort was almost too much for the Swiss as the world No.1 pulled away in the third and then the fourth. As Federer served to stay in the title hunt, Djokovic produced a flamboyant cross court forehand winner to claim his third Wimbledon title. It may not have gone the full five-set distance, but this men's final remained a fitting conclusion to a tournament full of shocks, surprises, and extraordinary champions. "Wimbledon Awaits" is the definitive account of the 129th Championships. Coming into the tournament, there was a particular significance to the defending champion, Novak Djokovic's bid for a third title. Thirty years earlier his coach Boris Becker had won the first of his three singles titles. Meanwhile women's world No.1 Serena Williams had her sights set on something really special - completing her hold on all four majors at once for only the second time in her career. There were some surprise early round exits. Fourteen-time major winner Rafael Nadal and defending champion Petra Kvitova were beaten by the qualifier Dustin Brown and former world No.1 Jelena Jankovic respectively. Britain's Heather Watson was two points away from victory over Williams before the American clawed her way to survival; while Novak Djokovic survived a dramatic five-set encounter against Kevin Anderson from South Africa. There were glorious displays too. In his semi-final against Andy Murray, Roger Federer was a straight sets' victor in what was described as a near perfect performance from the seven-time champion. The Ladies' Singles Final featured Serena Williams and Garbine Muguruza, an exciting, young talent from Spain. Williams won 6-4, 6-4, completing the Serena Slam 2.0 . The following day was the Gentlemen's Singles Final - Novak Djokovic versus Roger Federer. Victory for Federer would secure a record eighth men's Wimbledon singles title. However the reigning champion was too good - Djokovic won 7-6, 6-7, 6-4, 6-3 to collect his third title and match his coach's Wimbledon accomplishments. Narrated by Stephen Fry and featuring exclusive contributions from Novak Djokovic, Serena Williams, Roger Federer, Garbine Muguruza and Andy Murray, this documentary is a dramatic and entertaining record of the proceedings at Wimbledon 2015 and a perfect gift for tennis fans. 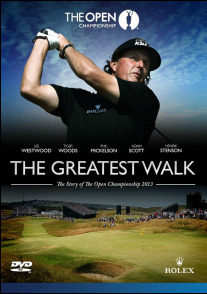 Good Guys Media and golf's governing body The R&A announce the release of A New Dawn - The Story of the Open Championship 2014. At Royal Liverpool, a young Northern Irishman realised a burning ambition - to win The Open Championship. Rory McIlroy became only the third player in the history of the game to win his third Major Championship by the age of 25 after Jack Nicklaus and Tiger Woods. Well on his way to achieving greatness, McIlroy displayed his irresistible best on British shores to become the 'Champion Golfer of the Year'. 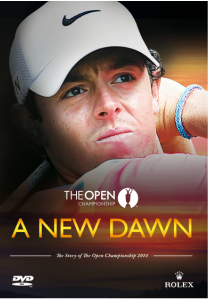 'A New Dawn' re-visits a captivating Championship in which McIlroy embraced the pressure and showed steely composure to lift the Claret Jug. Featuring interviews with the Champion and those who contributed to the drama, the film reveals the emotions in play and looks at how the game's new order was established. A valiant near miss from Sergio Garcia, Rickie Fowler's greatest Major bid to date, and a brave challenge from Adam Scott were among the highlights of the 143rd Open. But, from Thursday to Sunday, from start to finish, McIlroy led the way - the headline story, the man they all wanted to catch. He never flinched, did not panic when rivals closed in, and showed maturity beyond his years to win golf's greatest championship. On a summer afternoon in north-west England, golf witnessed a new dawn. Re-live the drama and excitement of Rory Mcllory becoming 2014 Champion Golfer of the Year at Hoylake. Good Guys Media and the AELTC announce the release of the Wimbledon Gentlemen's Final 2014. There was no more extraordinary moment than when Federer saved a Championship point at 4-5 in the fourth set. With Djokovic a heartbeat from his seventh Slam, the Swiss delivered what he believed to be an ace. The line judge called it out; Federer summoned Hawk-Eye and was proven correct. A few minutes earlier he had been 2-5 down, looking like a tired man running out of ideas, but it turned out to be a cunning disguise. With the aid of that pivotal challenge, he plundered five games on the bounce to take the match into the decider, and in those moments it seemed that destiny must be waiting for him. He would indeed become the oldest Wimbledon champion at 32 years 332 days; he would collect an historic eighth Wimbledon and 18th Grand Slam. It wasn't to be. The laurels were richly earned by Djokovic: for keeping his head after losing that Championship point and for seeing the match go into a decider when all the momentum had seemed to be with him. In that last set he battled all kinds of demons he needed the trainer for the second occasion in the match, this time to attend to his right knee in a medical time-out (previously it was his left ankle); he fended off a break point at 3-3 and then saw Federer save a whole clutch of break points himself. And all the while the crowd, forgivably, made no secret that their hearts were with the Swiss. Djokovic will not care. From the outset the intensity level was extraordinary. Federer was happy to come to the net, not so much intent on serve and volley as serve and attack. The quality of Djokovic's return was, as always, startling. The well-worn theory that Federer needed to keep the points short was blown away as the two went at it hammer and tongs, all the way to the breaker. Federer saved two set points before an unreturned serve gave him a chance of his own, and a Djokovic backhand went into the net. There was no telling which way the match would go. In the third, once again there was only one way to settle it, with a shootout. Federer opened with his fastest ace of the tournament at 127mph, one of 29 he would deliver in total. But Djokovic was racking up the passing winners, and then Federer sent a forehand wide for 3-5 when he had the court in his sights. It proved pivotal. Into the fourth, with all the momentum stacking up behind the Serb. As Djokovic neared 5-2, he urged the crowd to make more noise in appreciation of him, and they obliged. But it was nothing compared with their bellow of approval when Federer clobbered five straight games to take the match into the decider. They wanted the Federer fairytale, but Djokovic was writing his own story. He had been generous in defeat long enough. As he notched up two more Championship points, he blew a kiss to the heavens in gratitude for another chance. One of those two did go by, but at the third opportunity Federer dropped a backhand in the net, and the title belonged to Djokovic. Perhaps the Serb wanted to dance for joy, and maybe inside he was. Yet all he could manage was a peaceful smile. The journey is a long one, for those who seek Grand Slams. But the arrival is wonderful, and worth every step. Just ask Novak Djokovic. This 2 DVD set is the complete coverage of the thrilling 2014 Wimbledon Championship Men's Singles Final. On an unforgettable Sunday in July, Phil Mickelson finally lifted the Claret Jug after 20 appearances in the game's most historic major.The sun-baked course at Muirfield was rock hard, fearsomely difficult and should have been alien to the left-hander from California. Instead, in the balmy Scottish weather he thrived. The Greatest Walk retells the story of an intriguing week that served to enhance Muirfield's deserved reputation for identifying the best. Including special interviews with those most deeply involved, and exclusive footage from an event that will live long in the memory, the DNA of one of sport's most captivating dramas is revealed. Tiger Woods threatened to end his major drought, a fun loving 49 year-old led at halfway and Adam Scott came close to redemption. Going into the closing round, Lee Westwood looked set to prevail but, when it mattered most, Mickelson delivered a rare brand of excellence to finally prove his mastery over links golf. Many believed that becoming Open Champion was beyond the popular American, yet after producing what he described as "by far the best round I ever played" Mickelson proved his doubters wrong. As he strode up the 18th fairway, the Claret Jug almost in his hands, he could enjoy the moment; he could experience 'The Greatest Walk'.